Some dry days and wet days so far this year. - SMB balance year to date a bit more below average. SMB = Surface Mass Balance, which excludes mass loss from calving that on average is greater than SMB gain in the year. i.e. usually Greenland loses mass every year. GRACE follow-on data - where are you? - SMB balance year to date stays below average. I haven't read the whole paper yet, buy as the study uses GRACE data up to 2016, I would guess the only news is the locality of mass loss. If the Southwest is producing more melt, some other area of the ice sheet is producing less, given that GRACE has measured the total mass of the ice sheet with reasonable accuracy. The big news will come once the new GRACE data becomes operational. Then we will know if ice mass loss has slowed or even stopped in 2017-18, as indicated by a better surface mass balance and by the seeming slowdown in Jakobshavn calving. - SMB balance year to date further below average. GRACE follow-on data - where are you? Has Trump's shutdown delayed things? Denmark's Meteorological Institute have gone and decided to do a website makeover. Perhaps they have got a new IT director who has to show he has done something, anything, to justify his existence. Sorry, we can't find the page you're looking for. This may be because beta.dmi.dk is under construction. DMI temp north of 80 link still works, as does the SST site, though I expect this will be screwed up as well. - SMB balance year to date further below average. Image shows where precipitation is and is not happening. In other words - perhaps a continuing change due to lack of precipitation. (Most of Canada looking pretty dry as well). Our Pacific Northwest U.S., after record January 2019 warm temperature, now has Arctic & far northern Canadian cold pushing through the BC's Fraser Valley, spreading cold, mixing with Pacific Ocean moisture & presenting a foot of snow, east of Salish Sea(Puget Sound). Our local morning temps are 11degF. Now, predictions are for more snow. Our increasing cold, coming from Canada & the Arctic, & Pacific moisture, NOT reaching Canada, agrees with your assessment for northern Canada & the Arctic. - SMB balance year to date further below average. 2nd image shows where precipitation is and is not happening. - SMB balance year to date further below average. At already well over 50 GT or 25% below that average, becoming significant. In other words - perhaps a continuing change due to lack of precipitation. (Most of Central and Northern Canada looking pretty dry as well). GFS image attached. - SMB balance year to date further below average. At already well over 50 GT becoming significant. This is in major contrast with Snow Water Equivalent (i.e. Mass) in North America and Eurasia both running at well over +1 SD above average. In other words - perhaps a continuing change to further below average SMB due to lack of precipitation. GFS image attached. I must say it's becoming a bit disturbing. A lot of it is random variation but recently all coins fell on the same side. After a couple of good years, we may be sliding back towards the abyss. Whereupon, it seems that maybe it is a case of "all-change". In the last 2 days, precipitation has been above average. It looks very much as if the southern and eastern coasts of Greenland are going to have a lot of precipitation over at least the next week to 10 days. 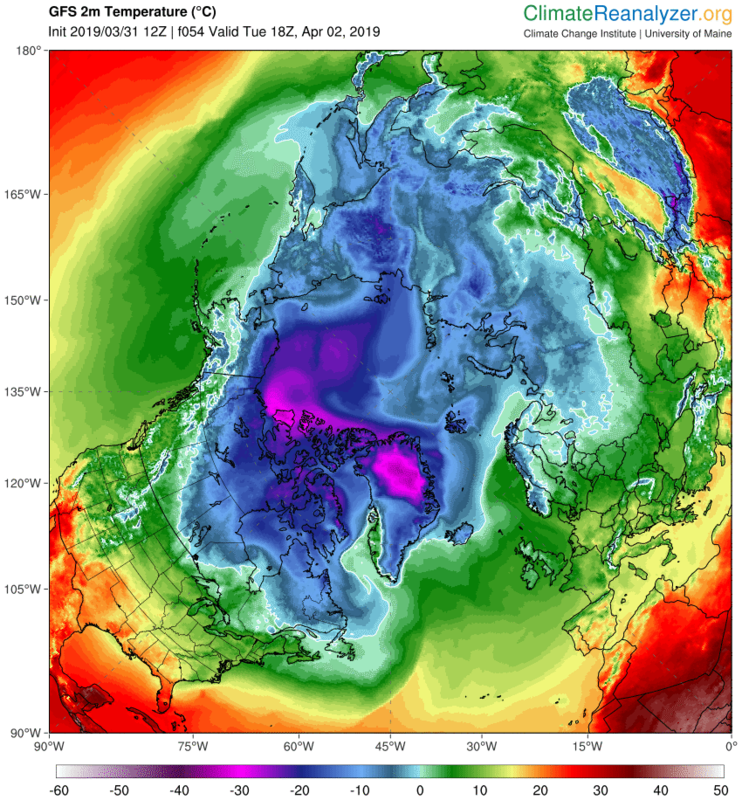 Is there a significant change in Arctic weather underway ? In the last few days, precipitation has been well above average. However, the signal for above average precipitation in the next week or so seems to have weakened. Note the strong sublimation on the West Coast on the 28th. In the last few days, precipitation has been well above average and below average. However, the signal for precipitation in the next week or so seems to have weakened (as has that for North America as a whole). In the last week or so , precipitation was well above average for a few days and in the last 2 days well below average. Accumulated SMB in the year to date is well over 50 GT (circa 15 to 20%) below average. The forecast for precipitation in the next week or so is for very low precipitation. The contrast with North America is great. In the last 5 days or so, precipitation was mostly well below average. Accumulated SMB in the year to date is around 75 GT (circa 15 to 20%) below average. The forecast for precipitation in the next week or so is for very low precipitation followed by in a few days by above average precipitation in the S.E. quadrant. The contrast with North America is currently very great. However, there are signs for the remainder of March of increased warmth meaning less snow and more rain.. Accumulated SMB in the year to date is around 75 GT or more (circa 15 to 20%) below average. However, it looks likely that precipitation could be somewhat above average over the next few days. This includes at least one cyclonic event from the S.E. identified in the recent paper about the significance and increasing frequency of summer and winter rainfall events. The contrast with North America continues - now N. America gets a bit dryer as Greenland gets a bit wetter. In the last 5 days or so, precipitation was mostly a bit above average. Accumulated SMB in the year to date is still around 75 GT or more (circa 15%) below average. It looks likely that precipitation could be somewhat above average over the next few days and concentrated in the south. This includes at least one cyclonic event being rain from much farther south in the Atlantic which GFS assumes to turn to snow when hitting the Greenland coast, even though GFS shows at or above freezing temperatures on that southern coastal fringe. Increasing frequency of summer and winter rainfall events ? Looks like possibly the first melt event of the season coming in a few days? It brings with it rain, and snow for higher elevations. In the last 10 days or so, precipitation was more above average than below. Accumulated SMB in the year to date is still around 75 GT (circa 15%) below average. It looks likely that precipitation could be somewhat above average over the next few days and concentrated in the south. This includes at least one cyclonic event on this Tuesday as noted by Darvince (see post above) being rain from much farther south in the Atlantic which GFS assumes to turn to freezing rain and snow when hitting the Greenland SW coast, even though GFS shows at or above freezing temperatures on that southwest coastal fringe. Will this show as melting on the DMI map for the day? Increasing frequency of summer and winter rainfall events ? pps: NSIDC's "Greenland Today" should be waking up this month. The cyclonic event on Tuesday 2 April as noted by Darvince (see post above) did happen. Parts of the SW coast and inland were above freezing. (first image). Rain from much farther south in the Atlantic was partly rain, partly freezing rain and partly snow. The rain is shown as penetrating some way inland (see image 2). I am guessing that as usual for the earliest above-freezing temperatures, it shows as positive mass balance because any rain refroze in the ice. In the last week or so, precipitation was more above average than below. On some days warmth has entered Baffin Bay with resulting melt (probably sublimation) along the SW coast (see todayssmb map). GFS predicts several days of fairly strong +ve temperature anomalies in Baffin Bay in the next 10 days. More sublimation, or even a melt event? It looks likely that precipitation could be somewhat below average over the next 10 days apart from a small area of high precipitation on the SE coast. This precipitation is predicted to come from the SE or East as a mixture of rain and snow. Maybe it happens occasionally, but I don't remember seeing 125km winds over Greenland. The 13th April was a genuine melting event (see first image attached). Only a little one but a melt event nevertheless. Accumulated SMB in the year to date is still well below average but increasing strongly, especially on the coastal region of the SE. It looks likely that precipitation could be very much average over the next 10 days especially on the SE coast. Much of this precipitation is predicted to come from the SE or East as a mixture of rain and snow. I was wrong - again. The melting event has persisted into the 16th April. This melting event has persisted unto the 20th April. The 13th April melting event has continued until the 22 April. Only a little one but a melt event nevertheless and early.. It looks as if the South West coast will be getting bursts of warmth on most days from 27th April onwards (per GFS). This is backed up by the weather forecast for Nuuk predicting daytime maxima of around +5 to +7 next week and beyond. This could produce a stronger and persistent melt event. In the last 2 weeks or so, precipitation was much above average. Accumulated SMB in the year to date is still below average but increased strongly, especially on the coastal region of the SE. Looks like really melting weather there. And GFS saying that Greenland (and Baffin Bay) is going to have a sustained and substantial melting event starting sometime this Sunday and continuing until ....? The 13th April melting event has never totally stopped, just reduced. Only a little one but a melt event nevertheless and early and persistent.. It looks as if it is already a tad stronger on the 25th. It also looks as if the Southern Greenland coast will be getting bursts of warmth to above freezing on most days from 27th April onwards and very strongly in the entirety of Baffin Bay next Monday. (per GFS). In the last 2 weeks or so, precipitation was much above average. Accumulated SMB in the year to date is still below average but increased strongly, especially on the coastal region of the SE.